McRae Original – Vietnam Era Jungle Boot. Back by popular demand, this is an authentic version of the original Jungle Boot as used during the Vietnam era. We still make it with the vulcanized DMS Panama outsole on the original equipment McRae used when the boot was a contract/mil-spec item. These boots, (also in alternate color combinations) remain popular due to their great durability, comfort, value. 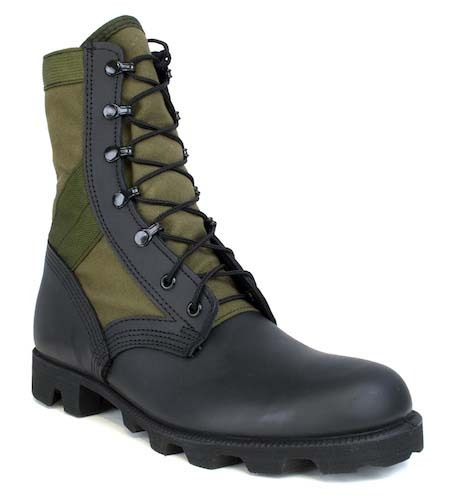 At McRae Footwear, we are committed to manufacturing the highest quality and most durable combat and military boots available on the market today. We continue to develop, manufacture, and market our combat boots in the United States as we have for over 50 years.